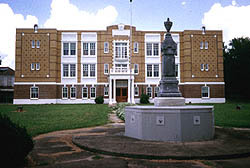 A school of beige and brown brick with off-white cast concrete decorative elements, Poydras High School stands on the edge of downtown New Roads. Noted for the quality of its brickwork, Poydras High School was vacant for a few years before being rescued by its new owner, the Pointe Coupee Historical Society. Built in 1924, Poydras High School is locally significant in the area of education because its construction represents a "coming of age" for public education in the parish seat of New Roads. Poydras High School is the descendent of a succession of schools made possible by the philanthropy of Julien Poydras, a local planter and public benefactor. When Poydras died in 1824 his will contained a clause bequesting the sum of $20,000 for an education fund, the interest from which was to be used for the construction of a school. 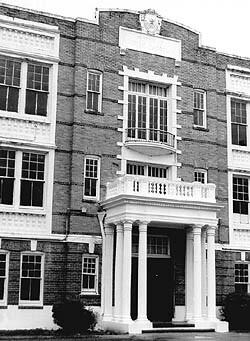 Poydras College, established in 1829 near New Roads, operated until the outbreak of the Civil War. A "Poydras School of New Roads" operated for a few years in the 1880s, and in 1889, the immediate predecessor of Poydras High School was established on the present site, named Poydras Academy. By 1912, the school had outgrown the resources of the Poydras Fund, and it was taken over by the Pointe Coupee School Board, which operated the school as Poydras Academy until 1923. In that year, a school district was formed, a $100,000 bond issue was passed, and the school board purchased the property in question. It is clear that the Poydras High school, a modern three-story brick school which made it possible to separate students by grades, and contained a library, gymnasium, and chemistry lab, opened an era of improvement in the quality of public education provided in New Roads. Historically, it represented a shift towards improved educational opportunities in the Parish, representing a statewide trend in the 1920s. Poydras High School is architecturally significant as one of the few neo-classical, high-style buidings in a parish where Creole vernacular is the predominant architectural style. Currently the school houses offices and a museum. Poydras High School is located at 460 W. Main St., in downtown New Roads. It is open by appointment only, please call the Pointe Coupee Historical Society at 225-638-9031 or 225-638-8333 for further information.